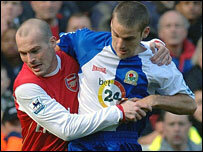 Blackburn outwitted Arsenal as Mark Hughes' side earned an FA Cup fifth round replay at Ewood Park. Thierry Henry had an early volley and Theo Walcott went close with a shot but for a side that has scored 81 goals this season, Arsenal were very subdued. Rovers keeper Brad Friedel was not called into action until the last 10 minutes - when he made a superb double save to thwart Henry and Justin Hoyte. Blackburn's best chance came from Matt Derbyshire's inventive hooked shot. Involved in three different knockout competitions, this was Arsenal's second of four cup ties in the space of 11 days. But with Blackburn so intent on defence and Arsenal so quiet in attack neither side was able to deliver a killer blow to win the game. Blackburn's defensive strategy provided Friedel with maximum protection, so much so that the Blackburn goalkeeper did not have a serious save to make until the closing stages when the game opened up. Friedel saved with his feet to deny Tomas Rosicky before he made that wonderful double save, tipping away Henry's flick and then getting up quickly to parry Hoyte's shot. Blackburn's left-back Stephen Warnock typified the visitors' concentration and he easily won his defensive duel with Walcott. But with 15 minutes to go, Warnock was lucky not to concede a penalty when television replays clearly showed he brought down Jeremie Aliadiere. Arsenal's best chance of the first half came in the opening 10 minutes when Hoyte's lofted pass freed Henry but the Frenchman blazed his volley over the bar. Blackburn's focus on containing Arsenal also meant that the home side's goalkeeper Manuel Almunia had an even quieter time of it than Friedel - in a first half that was strictly for tactical enthusiasts. David Bentley did try his luck with a speculative shot, while David Dunn had an opportunity to release Nonda but overhit his pass. Derbyshire eventually managed to test Aluminia, when the Blackburn substitute, with his back to goal, hooked the ball goalward, requiring the Arsenal keeper to tip the shot over the bar. By stopping Arsenal scoring Blackburn, who lost to Wenger's side 6-2 earlier in the season, became the first English club to keep a clean sheet at the Emirates. "We lacked spark and were a little bit flat but we were unlucky not to get a penalty. "They stopped the game as much as they could. We wanted to qualify in one game but it will go to a second. "The problem is not Blackburn but the problem is finding a solution when teams defend deeply and we couldn't find that today." "We came here with a gameplan and put it into practice. We kept them quiet and kept their chances to a bare minimum and were not troubled. "We are the first British team to stop them scoring at the Emirates. "We dictated where we wanted them to play the game and we made them play in areas that they didn't want to." Arsenal: Almunia, Gallas (Clichy 60), Toure, Senderos, Hoyte, Walcott (Adebayor 68), Fabregas, Flamini, Ljungberg (Rosicky 69), Aliadiere, Henry. Subs Not Used: Poom, Denilson. Blackburn: Friedel, Emerton, Khizanishvili, Nelsen, Warnock, Bentley, Mokoena, Samba, Dunn (Todd 90), Nonda (Roberts 84), Berner (Derbyshire 68). Subs Not Used: Brown, Peter. Booked: Dunn, Bentley, Khizanishvili, Todd.